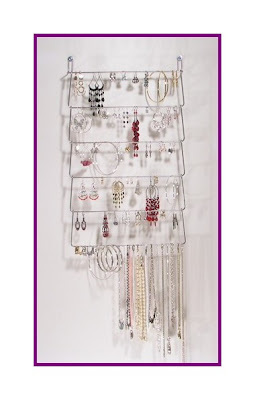 I have been looking for a good necklace holder for YEARS. 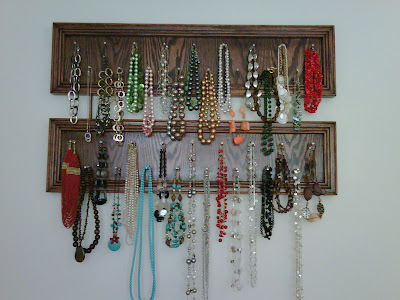 Back in college, I had an old wooden hanging coat rack (or at least I think that's what it was) that I hung my 10-20 prized necklaces on -- I loved it. 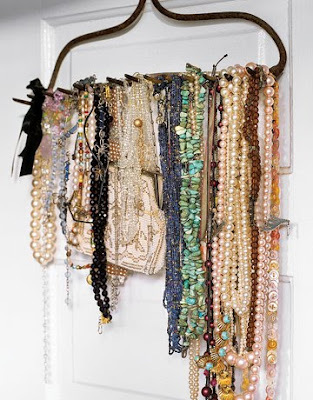 But as my jewelry collection grew and grew, and after years of abuse and overloading, it became flimsy and eventually fell apart. Tears were shed. 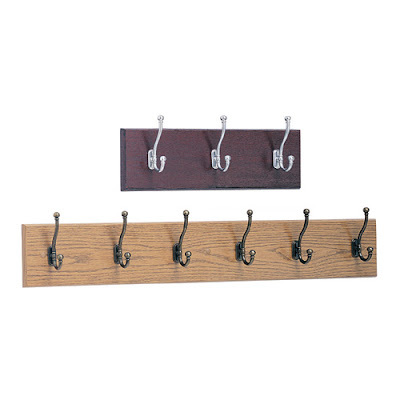 I looked all over for a similar product that was more sturdy but couldn't find anything that didn't look like, well, a coat rack. 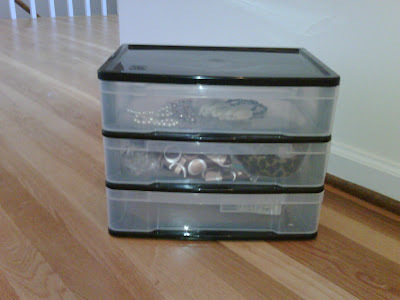 I moved on to keeping my necklaces in jewelry boxes (which was a disaster) and eventually bought a few plastic container drawers. Although maybe a good idea in theory, this was a logistical nightmare. 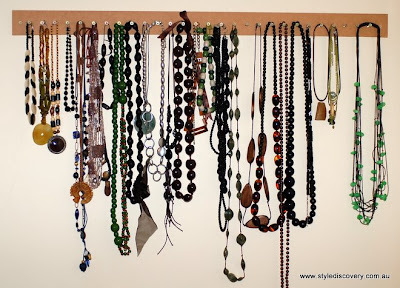 Every necklace went into the drawer with precision, nice and neat. 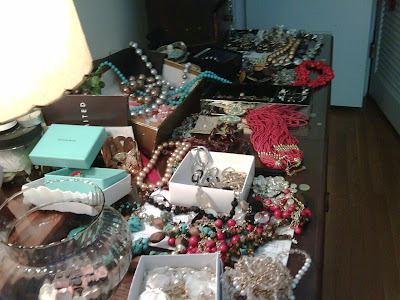 Every necklace came out of the drawer (whether one month or one hour later) an absolute tangled mess, throwing off the whole drawer and throwing me into a fit of rage. 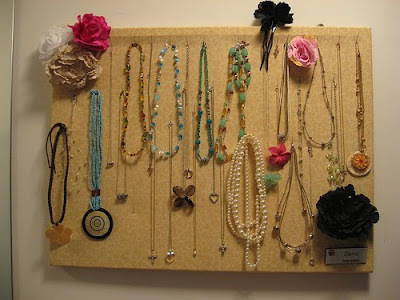 Half the time I couldn't remember which drawer I put the necklaces in, so I'd have to root around messing them all up. Half the time I didn't even remember what necklaces I owned because I couldn't see them, so they never got worn. It just wasn't working. My next brilliant idea (born out of sheer desperation and complete laziness) was to just pile them up on the dresser, in plain view. 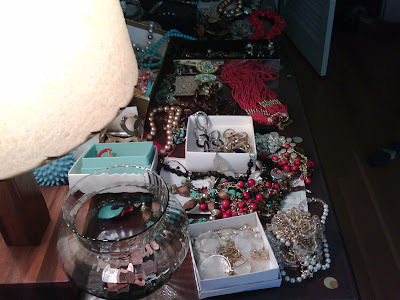 This might have been fine if I only had 5 necklaces, but with 50+ necklaces, the dresser was taken over and became just as big of a disaster as the containers. As of last week, this was the top of my dresser. Ugh! So, it was time to do something. 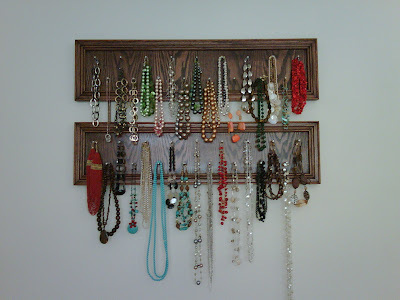 I wanted a sturdy, wood, wall-mounted necklace rack that woudl hold 50+ necklaces, with no tangles or mess. I scoured the internet for something (ANYTHING) that I liked and found zip, zilch, nada. 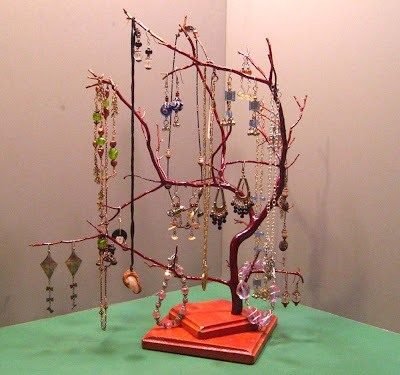 Everything out there was either a "necklace tree" which would still take up room on the dresser and not hold very many necklaces or were boring, ugly and cheap-looking. 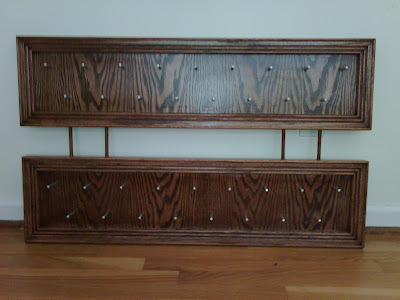 I found everything from cork boards with push-pins, to screws on a piece of wood, to velvet hangers with necklaces on it, to picture frames with chicken wire in them, to just another coat rack. These just weren't doing it for me. Enter Etsy Alchemy. I've used Etsy Alchemy quite a few times in the last couple months for wedding-related items and have been incredibly impressed by the quality of the products I get and the amazing customer service. I love the fact that I'm dealing with a real person, as opposed to a corporate giant. And I love that I get to work with such creative people that end up coming up with even better products and ideas than I ever could have imagined. 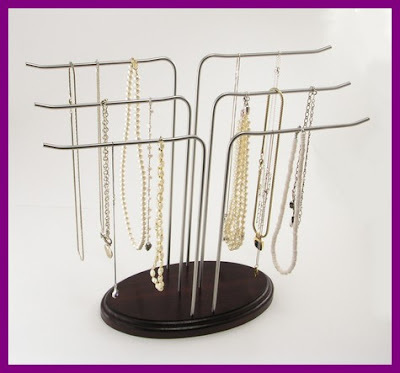 So, I put my request out there for a necklace holder -- preferably wood, with lots of pegs, simple but sturdy and elegant. Help! I got about 15 bids. I chose to work with the seller YoungWoodCreations, and we went to work. Joey was fantastic to work with. He asked me for pictures of my ides, my style and my favorite pieces of furniture. He came up with a design and we chose the colors, wood, shape, style and size I wanted. He always kept me up to date with the project and did an amazing job. A few months later, this fantastic piece of art showed up at my doorstep. Hand-made of oak with brushed nickel pegs and stained wood to match our bedroom furniture, this is a one-of-a-kind piece beyond anything I expected. Gorgeous! Thank you Joey at youngwoodcreations!!! They are fabulous! I love everything Joey has created for me. I always look forward to the holidays to see what he has come up with. They are very nice and I'm glad you found something that works for you! 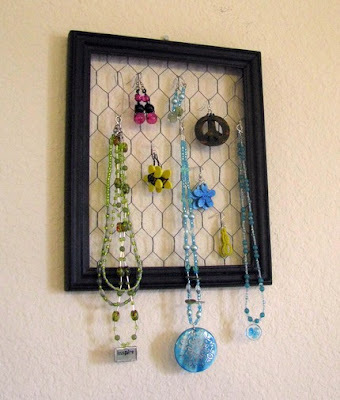 I love that necklace holder that you had made! It is fantastic and exactly what i have been looking for to give my mom for her birthday...any chance there could possibly be a replica made??? To Anonymous: Contact Joey (youngwoodcreations)at the etsy site given above. I'm sure he'd be more than willing to make another one! Best of luck!